The database cannot be opened because the VBA project contained in it cannot be read. It's all very confusing, especially when Compact and Repair does not help. The initial assumption is that the database is corrupt, which is partially true. People then resort to creating a new database and importing their objects into it which is time consuming and a pain. It solves the problem, but there's a better alternative to check first. 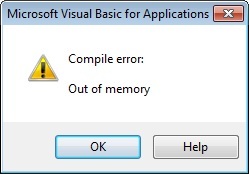 Fortunately, Microsoft Access offers a way to fix the VBA compiled state with the /decompile command line option. The Compact and Repair feature only applies to the tables and does not impact VBA code. The decompile command does. When Access is started with this and you open your database, it discards all the old VBA compilations, and leaves just your VBA source code. You'll need to compile again to get the compiled state. After compacting, your database may be significantly smaller. From Windows Explorer, locate where your Access program is installed by searching for MSACCESS.EXE. If you have multiple versions of Access installed on your machine, you need to identify the path to the Access version you want. Open up any module. Compile it via Debug, Compile.., then File, Save. Go back to the database and Compact it. The location of the Compact command varies by Access version. The database size should be reduced and the strange errors related to the VBA code should be gone. The example above is for Microsoft Access 2016, but it also applies to Microsoft Access 2013, 2010, 2007. 2003, 2002, 2000, 97 and earlier. Then, whenever your database is acting oddly, you can easily launch the decompile version of Access to open your database and decompile it. In a few minutes, you're back up and running with a smaller database.